How to run a foresight excercise? VTT has done foresight exercises since late 1990s, and the importance of foresight has been increasingly recognised in 2000s. Foresight in VTT has expanded from technology roadmaps to broader socio-economic and ecological contexts. Nowadays VTTs foresight covers both the “demand pull”: creating vision and identifying future drivers, markets and products; as well as the “science push”: responding to issues raised by science and technology. The focus of a recent strategy has been on searching for R&D driven solutions to grand challenges, e.g. linking challenges of energy and water issues, scarcity of raw materials, healthy ageing and climate change. 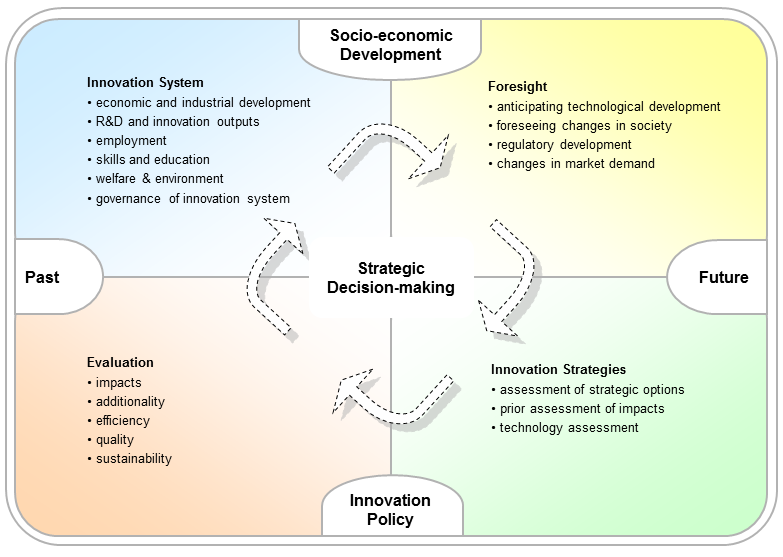 Foresight is seen as one part of strategic decision making in VTT (figure 1). VTT has an internal team called “foresight and socio-technical change” focused on doing research on and developing foresight and systemic societal change. The team also provides expertise on foresight both for internal purposes as well as external purposes, e.g. providing foresight services for clients. In 2012 a project aiming to network experts involved in foresight in VTT was launched. This foresight network captures the unique advantage of VTT: having both the technological competencies as well as foresight know-how under one roof. Here is a short list of foresight projects that VTT has done on the national, Nordic and EU-level. Emerging S&T priorities in public research policies in Europe, US and Japan. EU Platform Foresight , 2004-2005. Where it fits or connect the strategy planning of the organization with this approach? VTT in this case? Foresight is based on forward looking activities by using methods common to strategy planning procedure as well. Foresight is anticipatory, systematic and it assess ex ante societal impacts. In an organization these dimensions are of course also taken to the procedure, but the emphasis, and the methods and involvement of different representatives differ. The target of the process inside of an organisation vs in a technology foresight process or in a regional foresight matters. This will be more opened up in the course.